yippyyyy... the holidays are finally here! well at least for the mr. and i they are. tomorrow morning we're heading up to ohio to be with evans family for thanksgiving. this is easily my favorite holiday so i'm pretty darn stoked about it. we've got the tofurkey all set to come along with us and we'll be cooking up a vegan feast to impress. two of evan's nieces are vegetarian so it's always nice cooking delicious treats for them. i myself fully plan on curling up on a couch and watching the entire thanksgiving day parade with some hot tea and a comfy blanket. this is the relaxation i live for all year long. it's definitely tough to be away from my family on this particular day, but it's hard to be too down when i've got evan's extremely large, extremely animated, family to spend the next few days with. well i thought i would share with you, before i head off for a few days, a little craft that my bud steph and i did a few nights ago. 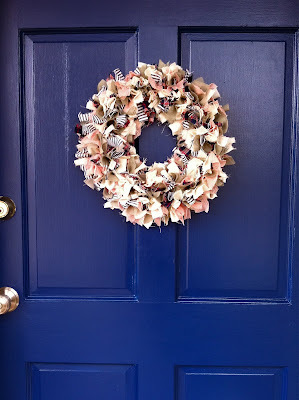 inspired by THIS POST on creature comforts, steph and i decided to try our hand at a little wreath making. i must say, it was the perfect craft to do while watching a moving and having a drink. we do crafting right! we even repainted our front door for a snazzy new look. SAVE A TURKEY... EAT TOFURKEY!